The alluring landscapes of the Himalayas come alive in this exquisite country called Bhutan. This Buddhist country boasts of a world which is incomparable to any other part of the world. The Stunning flora and fauna of this small nation draws tourists from all over the world. By Law Bhutan is supposed to keep sixty percent of its land forested at any point of time. This small land locked country has neighbours as populous grants like India and China. The happiness quotient of the people is of uttermost importance to this beautiful, angelic country. The growth index of Bhutan is measured in Gross National Happiness, which is never paid heed to by any other economy in the world. Buddhism is the main religion followed, in fact it is a way of life for them. No stone is left unturned to maintain the social cultural, spiritual and religious stance of the country. It goes to show the level of contentedness in the people, and of the economy at large. The Monasteries are innumerable with stupas and chorines that line the roads with colourful prayer flags flying high. The Bhutanese are very proud of their rich cultural heritage and believe famously in traditions. This is very evident from their traditional dress that they adorn till date. The beautiful and colourful hand woven crafts are still very popular. In a day and age of acute modernization, of every kind that has severely affected the people all over the world, Bhutan seems to have their priorities extremely saved and has consciously decided to keep the people as well as the economy protected from the big fierce hands of globalization. It is only in the recent years that the ecommerce development has begun, that too in the key fields like roads etc. The tourists are welcomed with open arms and a warm enthusiasm. 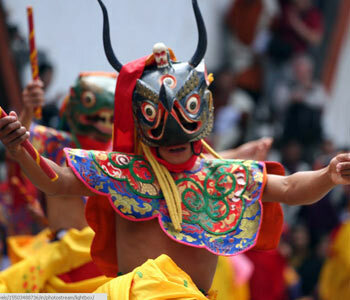 The famous dance festivals of Bhutan called the tshechu are strikingly a must do. The trekking trails discovering the inimitable plants and flowers like the beautiful rhododendrons, magnolias etc are out of this world. The birds that flock the country are a bird-watchers delight. The archery yet again is a unique feather in the crown. It is the national sport of this unparallel economy. The accessibility of an Indian tourist to its neighbour is very high. The doors are open via land or by air. Getting to Bhutan is as easy as visiting any North Eastern state of India. There is no visa required for an Indian tourist. The extremely simple yet stringent policy of this strong self-contained, spiritual economy for tourist is of �low volume and high value�, which is their main ethos, and this is how it remains pristine, in terms of people and the country.